This is the simplest formula for becoming a successful artist: All you have to do is create art and share it with others. 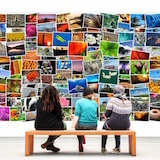 Plus, by sharing your art online, you will be able to connect with others who share similar artistic interests and maybe even learn something new from them. Explore ideas that others haven’t explored yet. Bring something new to the table by creating original, unique art that explores previously unexplored concepts and ideas. Remember, there are no shortcuts, you’ll have to operate by trial-and-error and you will likely make several errors before you begin to create good art. Start working now and create art every day. Make things with the time, space and materials you have right now. Write a song on your lunch break, make a painting with only one or two colors, etc. Understand that you’re not going to be that good at first and you might fail. But with practice, you will get better. Share your art with people on the internet. This is the best way for you to get your art out there! Plus, you will be able to connect with others who share the same artistic interests as you. Accept that you may not be validated for your art. You have no control over the way people will react to your art. If you come across comments that make you angry, channel the anger into your art instead of picking a fight with that person online. Save every nice email or comment and read through them to gain motivation whenever you need it.